Cari, the daughter of the late Cupid, was a thriving bed and breakfast owner. She wished that one day she would have the powers of her father when matching couples. Unfortunately, she only seemed to mess things. Her murder mystery weekend at the Inn was no different. When she tried to give a couple destined to be together a potion, the wrong people got the potion. This made a heap of trouble for all. 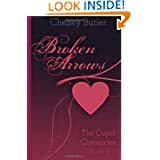 Just when things couldn’t get any worse the police were called; and not just any police, but her ex-boyfriend who recently came back to town. This was a really cute book, I would love to give it a higher rating, but unfortunately the book did end very abruptly. I was disappointed by that because it was such a good read. I am still rating it pretty high because the author did let us know there is more to come. I definitely do recommend this book, but I would almost say to wait until others are released. I feel this book could have had a better ending with more closure. But hopefully the other books give us just what we are asking for.